As Christmas is on the way, this month’s competition has a Christmas theme to it! 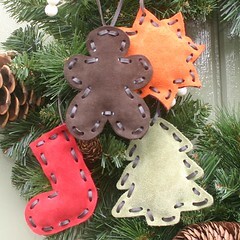 You can be in with a chance of winning a set of four suede Christmas Decorations. You can use them to hang on your tree or around your home, or you could use them individually to set off the gift wrap on those extra special gifts. All you need to do to be in with a chance of winning is leave a comment on this post. Yep, it’s that easy!